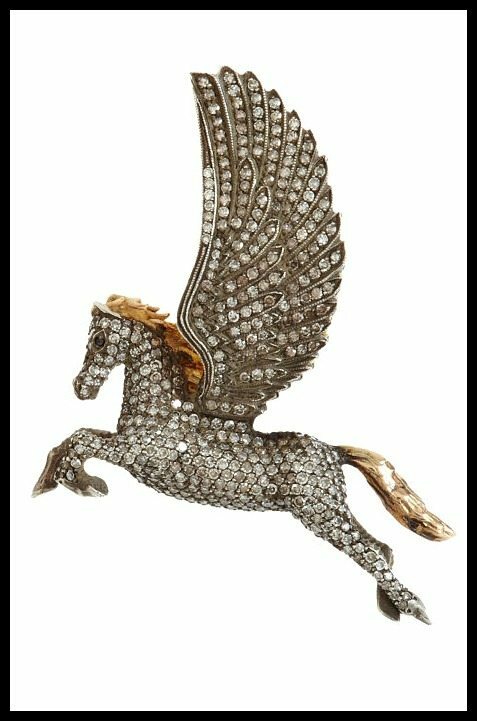 You are here: Home / Jewelry / Earrings / Diamond Pegasus earrings by Sevan Bıçakçı. Diamond Pegasus earrings by Sevan Bıçakçı. We’ve talked about the genius of Sevan Bıçakçı before, but last time was Halloween and we focused mostly on his more eerie designs. 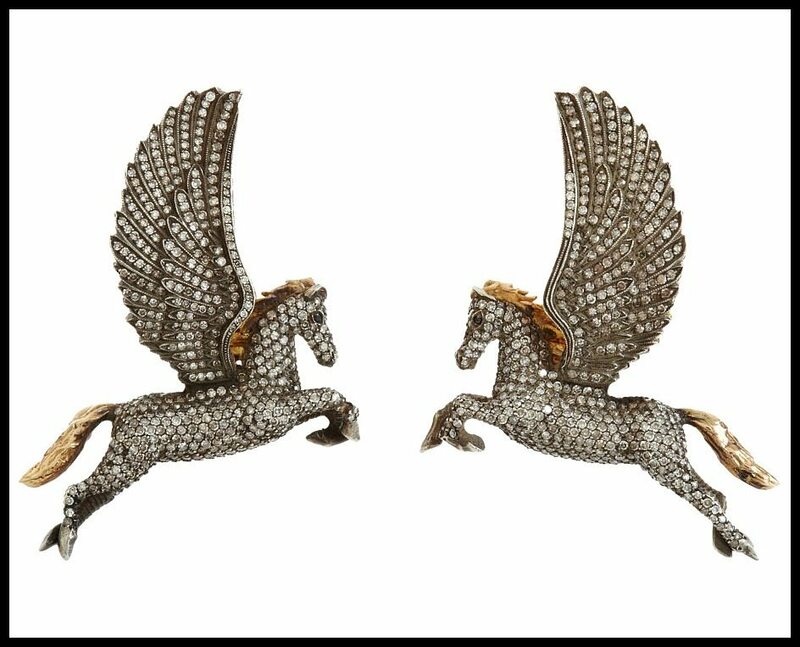 Today, we’re going to look at something completely different from Bıçakçı’s incredible repertoire: these black and white diamond Pegasus earrings. Or, as I like to call them, the itty bitty shiny pretty horsies. These beauties are made of oxidized silver and covered in 5.29 carats of black and white diamonds with rose gold accents. Their wings open to reveal an interior of 24 karat gold. 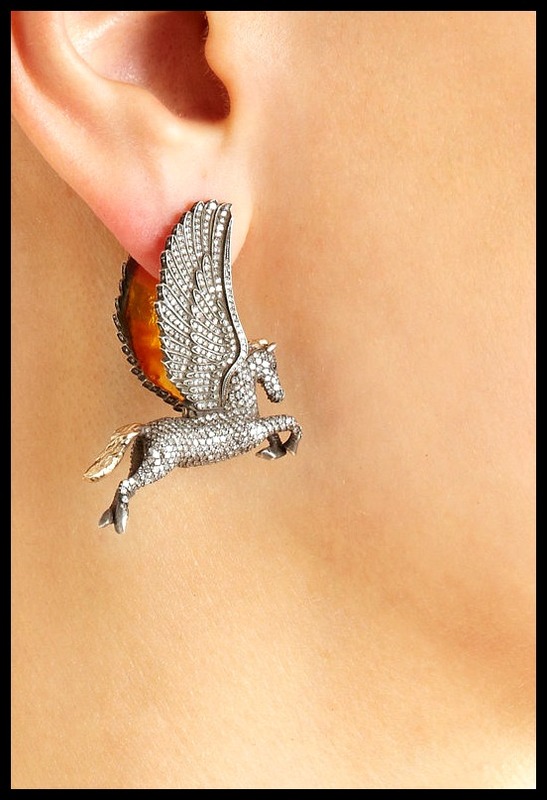 You know I’m not that into fine jewelry being “cute”, but I think these Pegasus earrings are almost unbearably adorable. Their appeal comes from how perfect they are: they’re not an interpretation of a Pegasus, they’re like if two actual Pegasus (Pegasui? Pegasuseses?) were miniaturized and rendered in black and white diamonds. I keep expecting them to move their wings or paw the air with a foreleg and I’m only seeing them in a picture. Just look at the flowing mane, the whipping tail, the tension in the lines of the body, and the layered feathers of the wings. They’re a breathtaking example of craftsmanship and a stunning design. It’s just that in this case, that makes them almost too cute to even handle. They are equal parts whimsy and serious beauty, and that’s what makes them so successful. What do you think of these itty bitty shiny pretty horsies, my dears? Would you adopt them? Build them a tiny golden stable in which to rest their glistening heads? This post is dedicated to my favorite lover of horsies of all kinds: my friend Elan and her Pegasus, Lancelot. 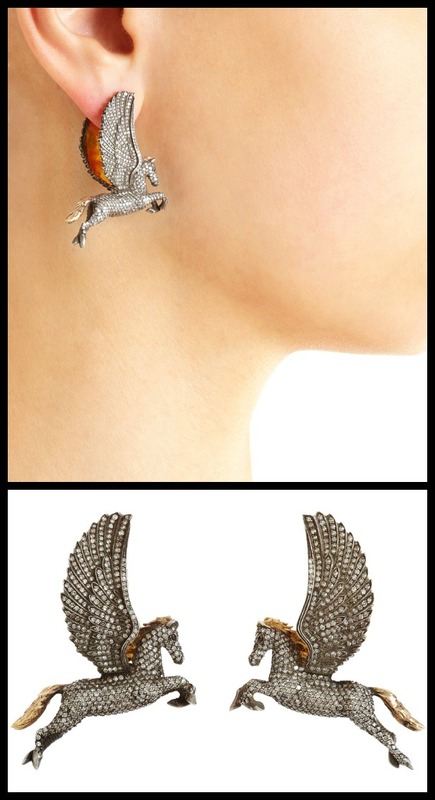 These amazing Sevan Bıçakçı Pegasus earring are currently available at Barneys New York. All images and info are thanks to Barneys. Oh. My. Goodness. I love the way they clip onto the ear via the wings. You’re totally safe with the cute factor – these are so much more than cute! Great find, Becky! They’re fabulous, aren’t they? I pretty much fell out of my chair when I saw them.